Ahwatukee is a hot market right now. It’s an enclave of Phoenix, so it’s part of the city proper, but it is set off by the South Mountain, making it feel like a community unto itself. Residents enjoy convenient access to all the business and educational opportunities that Phoenix has to offer, as well as its thriving arts and cultural activities, yet they don’t feel like they are overwhelmed by the hustle and bustle of the city. It’s a win-win for those who want a quieter way of life but also want easy access to exciting activities when they’re in the mood of them. When you are shopping for a home in Ahwatukee, it’s important that you look beyond the basics like school zone or crime stats. Of course, those things are important, but you also have to consider some of the more mundane things that might be below the surface. For example, a termite infestation can slowly erode the home from the inside, causing extensive damage that can either undermine the home’s structural stability or that can cost you thousands of dollars to repair (or both). Many people prefer to buy an older, established home. They like knowing the history of the home and how its materials and craftsmanship have stood up to the test of time. In addition, many people prefer the style of an older home since a lot of newer homes are made with speed and efficiency in mind, rather than style or quality. The trouble with an older home is that termites may have already taken up residence in the home, and you may never know it. Some of the signs that termites could be present – like mud tunnels on the foundation or termite wings or feces on the windowsills or door jambs – may have been cleaned away when the house was being prepared for sale. The homeowners may not have even done this knowingly; not a lot of people know the signs of termites. That means that you could move into the home thinking that everything is ok, only to discover a huge infestation in a few weeks or months. By then, the termites could have compromised the structural integrity of your new home, creating a huge hassle for you to deal with soon after you move in. So you may be thinking that the best bet is to move into a newer home, right? After all, the home will have brand new materials – there shouldn’t be any chance that termites have had time to take up residence. Well, what’s so fascinating – and terrifying – about termites is that they don’t sleep. They literally work, eat, and reproduce 24 hours a day, seven days a week. So it doesn’t take them long to find fresh wood to consume, and your new house is going to look awfully tasty to them. The best way to prevent this is to perform a pre-treatment on the house, starting with the foundation before the house is even built. Yet many builders skip this important step, leaving your new home vulnerable to these voracious pests. You may get a home inspection when you are buying a new house, but don’t assume that includes a pest inspection, or a termite inspection, specifically. In most cases, it will not. You could have a thriving termite infestation in the house and never know it. You could have a colony of rats living in the walls or a huge nest of scorpions. The only way to know for sure what you are dealing with before you commit to the property is to schedule a pest inspection on your own. Make sure you get a termite inspection as part of a comprehensive inspection, or schedule a termite inspection specifically. Termites are some of the most damaging pests your home can face, so finding them as early as possible is essential to protecting your home. 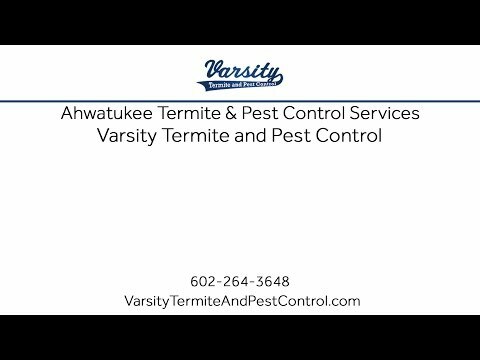 Varsity Termite and Pest Control serves the Phoenix area and Ahwatukee. We offer termite inspections and treatment for new and older homes. Our termite control services include pretreatment for new home builds, as well as preventive treatment for existing homes. We also have effective methods for eradicating termite infestations to save your home from these destructive pests. Call us today to schedule an inspection or to learn more about your termite control options in Ahwatukee.